Recently I was given the opportunity to preview an upcoming new game that will soon be available to back on Kickstarter. I received a print and play file of the game and rules. These are my thoughts and opinions on the presented materials. Enjoy! 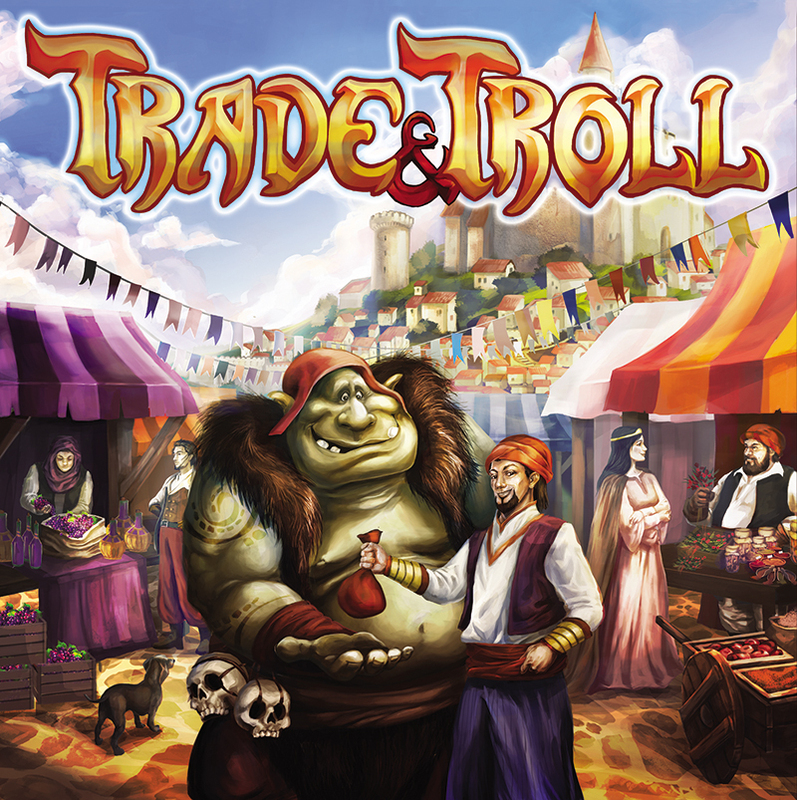 Trade & Troll is a game by Emanuele Buffagni & Giulio Torlai, published by Good & Evil Games. It is for 2-6 players. 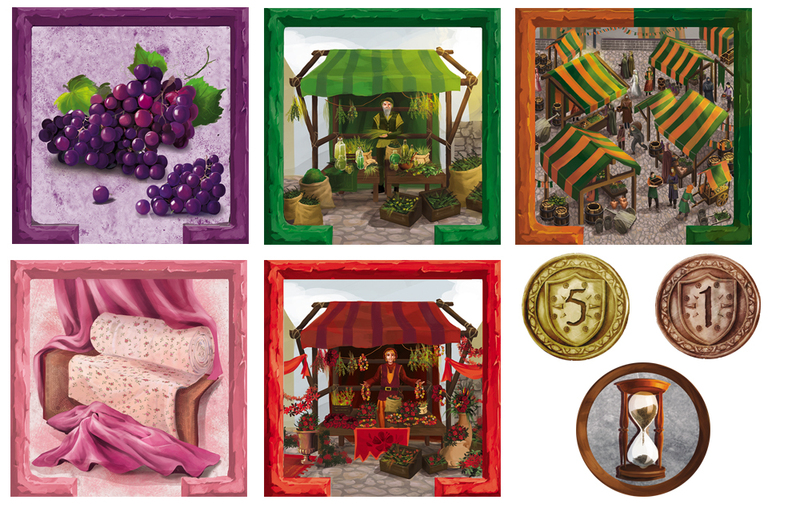 In this game, players will take on the role of merchants in a medieval town. They will be trying to create effective routes between their resources and stalls and then on to the market. They will have to watch out as their opponents will try to block their routes and keep them from being able to fill their stalls. On top of that, they’ll have to be on the watch for the greedy troll who will also block their trade routes. In the end, the player that can best manage their goods, stalls and market will be declared the winner. To begin, the board is laid out in the middle of the play area on the appropriate side, based on the number of players. The Closed Road tiles are placed on the board according to the number of players as well. For more information on placement check the rule book. Players choose a color and receive the merchant meeples of their chosen color as well as the corresponding colored troll bag. The first player is chosen and receives the first player token, which is placed in front of them on side 1. The Initial resource tiles are shuffled together and each player is dealt 1 tile. A Road Tile is is given to each player except for the last player. The Building Tiles are shuffled into 3 separate piles based on their types; Resource, Stall and Market. The 3 separate piles are placed face down near the board. The remaining Initial Resource tiles are reshuffled and placed on top of the Resource tiles. Five of each type of tile are flipped over and placed face up beside the board in a row. Each player is then given 5 coins of 1 value. Beginning with the First Player, players now take turns in turn order placing their initial building tile and road on the board. Players must follow the rules of placement in regards to placing their road and building. Players now place one of their merchant meeples of their color on top of their building tile. Play now begins. The game is played over a series of rounds. Each round is divided into 3 phases; troll auction, player actions and end of round. The first phase is the troll auction. In this phase players gather up all their coins in their left hand and then place a secret bid in their right hand. Once all players have their bids ready, they now simultaneously reveal the coins in their right hand. The player that bid the most wins the troll and is then able to put him into play. The troll can be placed in an intersection between two roads blocking the way between buildings, or he can be placed on a building itself keeping it from providing materials to other buildings. The winning bidder also receives a victory point token and the Acquisition token which is placed face up in front of them, keeping them from bidding on the next auction. Once the troll has been placed, players place the coins that they bid into their colored troll bag. These will not be used during the game but may count towards victory points at the end of the game. The second phase is the player actions phase. In this phase, players take turns beginning with the first player. Once all players have completed their first action, the first player turns the first player token to the 2 side and players now take their second action in turn order. Once players have completed their second action, the phase is over. 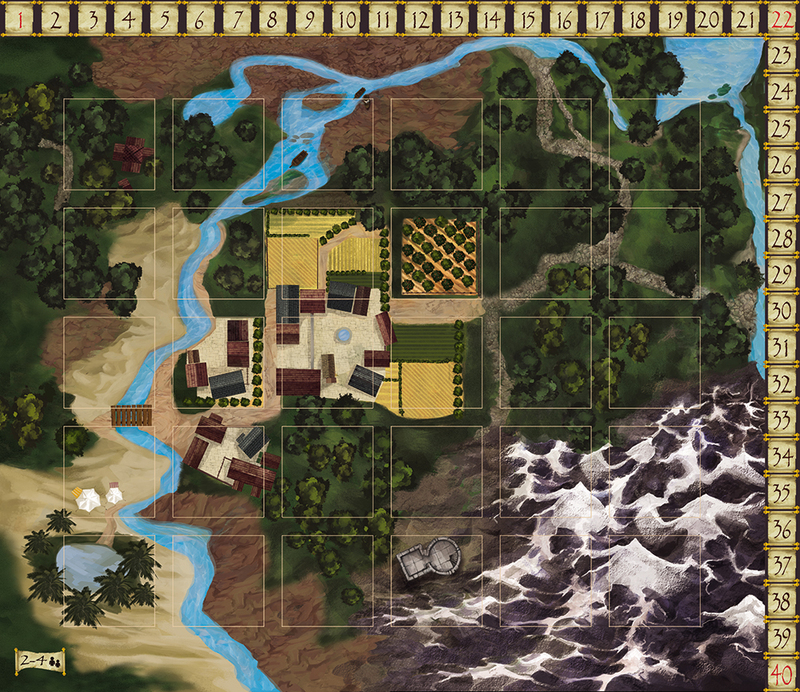 Players have 4 different actions that they can take; buying and placing a building, buying and placing a road, activating a building and passing. To buy and place a building the player spends a set amount of coins to place one of the face up buildings beside the board onto the board, following the rules of placement. They then place one of their merchant meeples on it to show ownership. A new tile is then drawn to replace the taken tile. Resources cost 3 coins, stalls cost 8 coins and Markets cost 15. To buy and place a road, the player simply pays 2 coins and places a road on an unoccupied road space. To activate a building, the player chooses a building that has not already been activated and that is connected to the required building with open roads. The player then takes an amount of coins based on the building type and places the merchant meeple in the lying down position. It should be noted that players are allowed to rent other player’s buildings to fulfill requirements for the activation of a building. The rented player’s building rewards that player with a set amount of coins based on the type of building. Also of note, resources don’t need to be connected to any other buildings to be activated. Stalls require connection to the corresponding colored resource. Some stalls have two colors and require connection to two resource tiles. Markets follow the same rules as stalls and must be connected to two different stalls of the appropriate colors, even if a single stall contains both colors required by the market. Passing is done when a player can not or does not want to carry out any of the actions above. The final phase is the end of round phase. In this phase a few things must be done in order. First the first player passes the first player token to the player on their left, who then places it on the 1 side in front of themself. All merchant meeples are then returned to their standing positions. The troll is then removed from the board. A new round is then able to begin. Earlier I mentioned the rules of placement. Basically what this is that when a building is placed it must be placed on a square that is adjacent to another building that is already on the board. It should be noted that the entrance must not be facing a closed road. When placing a road, the path where the road is placed must be between 2 building squares and must be connected to at least one other unclosed road already on the board. It also can not be placed on top of another road or closed road. The game continues until one of two things happens. If there are less than or the same amount of free spaces on the board as there are players, the final phase of the game begins. There are then only two rounds left. The final phase token is used to show which round it is. If at any time there are nor more spaces left to place buildings, the game ends at the end of the round. This happens even if the game is already in the final phase of play. It should be noted that during the final phase, the troll auction does not take place. Once the game is over, players calculate victory points based on several factors. A merchant meeple should be used along the scoring track of the board to keep track of each player’s points. Players gain points from buildings they constructed that have a road in front of it and is connected to the proper resources. They lose points for each building that does not have the proper connections. Players also gain points for every 10 coins in their possession. At this point, players will now empty their troll bags and count up the number of coins. The player with the most coins gains 3 points while the second most gains 1. Players now compare their victory point totals and the player with the most points is the winner. Since all I received for this review was the print and play files, I won’t go into too much detail here. If you want to more know about what will actually come with the game, I suggest checking out the Kickstarter link at the bottom. Basically what I can tell you is from the design images that I’ve seen in both the prototype rulebook and the WIP thread on BGG, everything looks pretty solid. You kind of get this feeling of Settlers of Catan with a little touch of Jaipur. The artwork looks to be pretty good. I’m hoping that the quality of the components is as good as the artwork is. A couple of things that I’d like to see is for the troll meeple to actually look like a troll. It would be great if it was larger and shaped like a troll or had a sticker that you could place on the wooden meeple to give it the look. Here’s hoping that the merchant meeples are done the same way, shaped like a merchant or stickered. Apart from those two things I’d say that the game is already headed in a really good direction. I think players will be happy with the finished product. Just like the components, the rulebook also falls into the same category of print and play quality. The rules that I received look a bit more polished and pretty than the components though and look to have a lot more of the finished look to them. Reading through them, I didn’t see anything that looked difficult to understand or confusing based on design. Everything appears to be well thought out so far. There’s even a special set of rules for 2 players. Also included in the prototype rules are some frequently asked questions and a very nice reference guide on the back page. There are lots of pictures and examples in the book so everything should be pretty clear. Overall I think based on what I’ve seen so far, the rules should be in pretty good shape. This is a fun game that’s fairly easy to play. The first phase of the game is all about bidding. How much do you want to pay to use the troll to block your opponents or to keep your opponents from blocking you. You also have to think that every time you win the troll, you’re getting a victory point which can seriously add up if you win several times. For this part of the game it’s all about out thinking your opponent. Will they choose to go low expecting you to outbid them or will they go high to outbid you. In the second phase your looking at several different options to take. You’ll earn quite a few victory points at the end of the game for the more expensive buildings but you’ll have to pay quite a bit of coinage to get them on the board. You also have to think that if those buildings aren’t connected to the proper resources then you’re going to be losing points instead of gaining them. Another thing to think about is collecting coins, which you’ll need to be able to purchase those buildings to place on the board. In many ways, the game is a balancing act. You have to think about what you want to do and how you’re going to do it, usually a couple steps in advance. It’s this balancing act that I really enjoy. I also like that the game penalizes you for not keeping an eye on what your opponents are doing to your buildings. In some ways the game has a little bit of a worker placement feel in this phase. Once the game reaches it’s end, it’s point salad for everyone. You get points and you get points. Oh wait, no you lose points cause your building isn’t connected to the proper resource. Scratch that. Needless to say, I really feel like this game will appeal to a wide variety of players. Fans of bidding and worker placement games should enjoy this one. This is a game that I recommend. It’s definitely worth trying. Trade & Troll is a light game that incorporates several mechanics into a melting pot of fun. The game doesn’t take an extremely large amount of time to play. Most game sessions last around 45 minutes to an hour, depending on the number of players. The game looks really good from all the pictures I’ve seen in the rulebook and the WIP thread on BGG. I really like the board and building designs. I’m hoping that the troll and merchant meeples will get a nice upgrade with some Kickstarter stretch goals. The rules seem well written already and should be polished to perfection once the game is produced. The game itself highlights both the bidding mechanic as well as some worker placement aspects. I like how easy the game is to teach. It’s easy enough that my kids can play without any real problems. I also like the many different ways to earn points and the use of negative points to penalize players that aren’t keeping up with their opponents moves. I really feel that the mixture of mechanics will really delight most players. Fans of worker placement and bidding games should enjoy this one. It’s well designed and looks like it will be well produced as well. I recommend this game and look forward to seeing it once it’s finished. For more information and to back the game right now on Kickstarter, just follow the link below. This entry was posted in Preview Reviews and tagged board, board games, buffagni, card, card games, emanuele, Emanuele Buffagni, evil, games, giulio, Giulio Torlai, good, good & evil, good and evil, torlai, trade, trade & troll, trade and troll, troll. Bookmark the permalink.